251.5 (LHF) 269.5 (RHF) 232 (LHR) 236.5 (RHR) totalling 989.5 kg.. Date line: Monday, 13 November 2006; and Project Merlot features in the Evening Star Newspaper. The invitation was innocent enough. When the message was received at Eastern Region headquarters in August 2006, technical guru Robbie Marsh was put straight on the case. “Oh dear me,” was his first reaction as he spotted the car, in the yard of a Cambridgeshire garage. The bodywork was poor, with several large dents and numerous deep scrapes, not to mention the rust and corroded alloys. The interior was a very sad sight, with peeling wood trim and a general air of neglect. On further investigation Robbie discovered the Merlot had been driven until its motor had seized. The radiator was completely blocked and the engine had simply cooked itself. Area coordinator Martin Curtis said: “No doubt the previous owner had loved the car but it looked like it was now the end of their relationship. “Robbie’s expert opinion on this sad wreck was that restoration was simply uneconomical. “So we had a dilemma. Did we allow the poor car to go to scrap, or could we somehow turn this into something worthwhile, with a little imagination and a lot of hard graft? As is often the case, where an opportunity exists, it gets discussed down the pub. The pros and cons of each option were debated over a pint or two. Martin, Robbie and fellow member Jon Elsey seized the moment. They had soon agreed a price to buy the car, pay off the previous owner’s garage bill and get it delivered for a thorough inspection. Meanwhile graphic designer Jon had been giving the subject much thought, and when he was feeling particularly inspired one rainy afternoon, produced a Photoshop image of a Merlot track car complete with Eastern Region graphics. The Owners’ Club National Rally was less than three weeks away, and because every plan works better with a tight deadline, they decided to unveil Project Merlot at the Lincolnshire event. So several hundred man hours later, after much fluid had been spilt on Robbie’s drive (some of it oil, most of it sweat! ), the car boasted a replacement engine and radiator, refurbished wheels, and restored interior. Dents had been knocked out (sort of! ), and bare metal crudely painted. Other club members then stepped in to help. Gary Kearley gave the car a professional polish, and sign writer Ady Neill made and applied the eye-catching graphics which Jon designed. 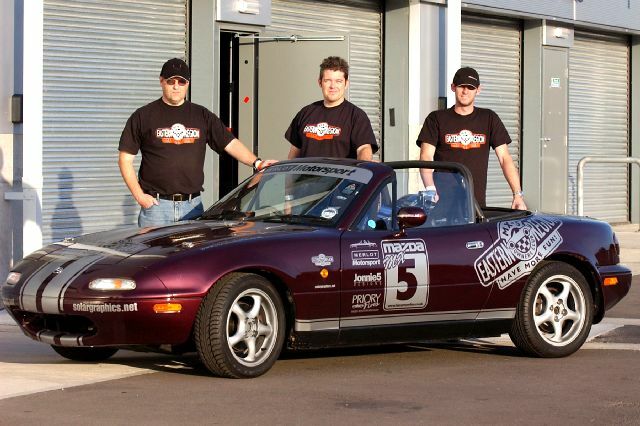 Project Merlot was once again roadworthy and fit to be seen in public! At the rally, members stripped the car with the aim of selling any parts that were deemed not essential. The grey leather seats had already been sold through an MX-5 online forum. Martin said: "We wanted to recoup some of the costs, and get people interested in the project. Crowds flocked round the car to see what all the fuss was about. ”We were extremely busy, with people buying or part exchanging bits and pieces all day. We nearly broke even that day, but we've spent more on the car since then!" A week later the tax, temporary insurance and MoT all ran out simultaneously. With mounting trepidation, the trio booked Project Merlot in for its MoT. Amazingly, it flew through the checks, with just one advisory - that the passenger seat was missing! Then they taxed and insured the car, and fitted it with two racing seats. At the Eastern Region Tech Day in October, many other members became involved with the project. Engineer Ken Ward fitted a four-point roll bar, assisted by Ian Ward, Jamie Day and expert welder Steve Alleyne. It proved to be a test of ingenuity as they used angle grinders and hacksaws to carve in to yet more of the interior. Although the car was initially bought by three enthusiasts, a real team effort has developed to get it ready for the track. Some members have donated parts either to equip the Merlot, or to sell to raise funds. Members are now looking forward to the day when they can get behind the wheel. Gary drove it up and down the road at the rally, and said: “I nearly demolished the club's display by accident! I’d like to go on the track with it, especially now it looks so cool with the roll bar and race seats. It's a great opportunity, and it's something I'd never do with my own car." Steve would also love to drive the track car, and he said: “It's a great idea. I think I would have to join a very long queue to drive it - but they probably wouldn’t let me in it anyway!" As preparations continued, Jon said: “This is now about more than putting a car on a track. Project Merlot has brought a lot of people together, and thrown down challenges - which so far we have managed to solve. “We knew Robbie was a Roadster expert, but we didn’t know about Ken’s brilliant engineering skills, and we didn’t know that Steve was such a good welder. So it’s brought a lot of people out of themselves, and revealed their talents. And we haven’t even got near a track yet. Hence another idea is born - today the Eastern Region is issuing an invitation to other areas of the MX-5 Owners’ Club. It plans to host an inter-club challenge which will be the first of its kind. Could your area build a car to rival Project Merlot?